It must have been hard to debug, considering the waves of huge changes you made to the game. That’s true. This may seem like an inside joke, but there’s a character based on Kamiya-san in the game. When we were debugging at Mario Club17, we were really busy as new features would be added on, creating a lot more issues that had to be verified. So everyone was on edge. And that’s when this Wonder-Director would cause a bug.17. Mario Club: Mario Club Co., Ltd. debugs and tests Nintendo software which is under development. (turning to Kamiya) I hope you’re feeling sorry. So this Wonder-Director is one of the hundred heroes? He’s a bit of a hidden character. If you play it enough, he’ll appear, but he can do something a bit unique, so he was something to watch out for during debug. Physically, he’s very unique looking as well, and his collision detection18 seems a bit different than other characters. 18. Collision detection: The area in which player and enemy characters can receive an attack. It’s just our creative staff’s way of showing their love for Kamiya. I just need to clarify something: I didn’t say “Let’s put him in.” We were planning on putting in several hidden characters and we had numerous candidates, but he was a low priority. But as the candidate characters got whittled down, they said “Well, we’ve already made him,” and before I realised it, he was in the game. They even made special movement for him, so he runs like a middle-aged guy. When the memory was already so full! And he has his own original voice too. Pointlessly extravagant. Who will get a kick out of that? Please do. Kamiya put a lot of love into that. This game has a lot of fun characters, so I wanted to make it an amazingly different game, and I managed to make it happen. This is a character whose name you can’t yet reveal? That’s right. Just like with Wonder-Director, if you play enough, that character will appear as a hidden character. And “that character” has been re-designed to match the world of 101. I hope everyone will get a kick out of it. I’m excited to see what that character will look like when translated into the world of this game. Just like the original, the character will fight with guns, and that other trademark item has been changed into a mask as well. The character will also have its own Unite Morph. Its very own Unite Morph? A lot of work’s been put in, right? The specs are slightly different too, so it’s a bit of a tricky character. As you play through the game, you can use attacks where you become larger, and the part where I think you can really see all the thought that went into everything is that just like in the original game, the character won’t fight with guns in that mode but will fight with hand-to-hand combat. All the movements are carefully, carefully made. Those specs are really high-level for a hidden character! The staff member who created the original movements worked on it. It’s the same motion animator. 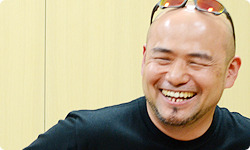 He’s always smiling, and no matter what kind of crazy, selfish request Kamiya has, he does it. He’s really great. It’s so nice to have someone like that. Then you don’t have to worry if you need to say something crazy. He really understands that it’s all for the game. I worked with him for the first time on Viewtiful Joe, and this was my third time working with him. 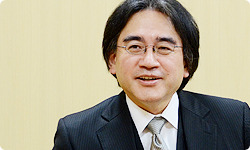 He’s an indispensable member of the staff who can grant Kamiya’s wishes. This was when he was unbelievably busy and must have had no extra time at all. And yet so much thought still went into making it. Every time we have this kind of conversation it makes me realise just how much making games is about teamwork. I think if you just realised the director’s vision as-is, you’d only get about 70 points. When you toss different ideas back and forth with the staff during development, each person puts a lot of energy into it, and only then you make something that could be 100 points or even 120 points. When I was talking to Minami-san and Inaba-san last time, they told me that every one of the staff members of PlatinumGames has a very unique personality and focus, and they all know just what they want to do. While it’s very important to have a core idea, that wild energy can really combine with it to produce something new. I feel like that’s something that’s distinctive to PlatinumGames. 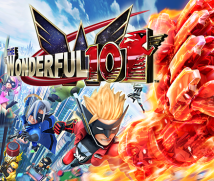 And I can feel it in The Wonderful 101. The sense of variety that you can feel is really made up of all the passion that the various staff put into this. Each person’s unique character creates a kind of chemistry and the things that can happen are beyond the imagination. Were you surprised as the director? Yeah I was. And that’s the best part about this job. When you get a lot of that, things get really interesting.